Blossom is an oriental oasis in the heart of Las Vegas. 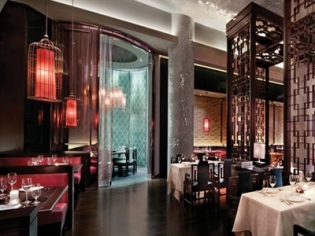 Cutting-edge and classic interpretations of Chinese cuisine will excite and delight you. Fresh seafood tanks and table-side prep are hallmarks of a Blossom experience. Experience the serenity of an elegantly lush Chinese garden when you enter Blossom. You may choose to dine in the trellised sunken garden for intimacy or in the circular banquette area for people-watching. The classic Chinese cuisine is bursting with exotic ingredients, while the modern influences of contemporary China are also available in some cutting-edge menu choices. A live seafood tank and table-side prep of various gourmet selections set Blossom apart from the crowd. Five star service is a hallmark of Blossom, where an extensive wine list is also available. Enter Blossom through the curved wooden walk and be transported to the Far East with exquisite savory culinary creations. For true aficionados of Chinese cuisine, inquire about the specialty dishes that must be ordered 24 hours in advance. For larger parties and special occasions, five private VIP dining rooms are available.